Rockers Against All Will (AAW) play hard, yet never lose sight of stirring up conflicting emotions, channeled through bracing riffs and complex, beat-anchored rhythms within their latest EP A Rhyme & Reason. The members of AAW had crossed paths over the years in the Hollywood music scene and knew each other by reputation. “When we arrived at the line-up now, it just jelled, each of the guys really bringing their own thing to the table; some people just play what they’re given, but these guys each add their own little thing,” Allen says. 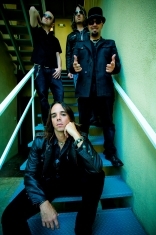 AAW released two singles, “You Can’t Change Me” (2007) and “Tomorrow & Today” (2008) gaining momentum culminating in the current band lineup and their 2009 debut album A Rhyme & Reason. The band’s most recent singles, “All About You“ remixed by Jeff Tomei (Matchbox 20, Smashing Pumpkins, Jerry Cantrell) and this past summer’s smash hit “The Drug I Need,” both garnered rock radio attention. Crafting music in the studio is an essential part of the AAW equation. A Rhyme & Reason was recording at KoЯn Studios Hollywood, a location that the band found inspiring and unique. But the real environment that AAW thrives on is delivering the goods live. “We’re all veterans playing on the road and we want people to get their money’s worth,” Allen says. AAW records for Subsonic Industries, an independent label created by Allen and the band’s manager, music industry veteran Sam Kaiser. Future plans include signing other artists and recently, AAW and Subsonic Industries enjoyed two of the top charting Active Rock independent label singles in Mediabase rankings, an impressive achievement for a relatively new record company. And then there’s the ever growing “AAW Army” of loyal fans registering all over the county and around the world, linked through the band’s website along with their myspace and Facebook pages as well. December will see an exciting giveaway of an ESP guitar and a Baby Taylor acoustic guitar to one lucky AAW fan. Details on the drawing can be found on the official Against All Will website.